For the Mornay sauce: In a small saucepan melt the butter. Add the flour to the butter to form a paste and cook for 1-2 minutes stirring constantly. Pour the hot milk into the flour mixture and cook for about 3-5 minutes or until sauce has thickened and coats the back of the spoon. Remove mixture from the heat and add the salt, pepper, nutmeg, Parmesan, and Gruyere cheese. Stir to combine. Set aside the Mornay sauce. Before assembling the sandwiches, preheat a grill pan or skillet to medium high heat. Slightly toast the bread either in a toaster or in the skillet so that the bread does not get soggy when the Mornay sauce is added. Spread butter on one side of each piece of bread and place each slice butter side down. Spread the other side of each piece of bread (the side facing up) with Dijon mustard. To assemble, spread a tablespoon or so of Mornay sauce on the bottom piece of bread. Next place two slices of ham and about 1/2 cup Gruyere cheese on top of the Mornay sauce. Top with the second piece of bread with the butter side facing out. Brush grill or skillet with butter and place the sandwich on the pan and cook for 2-3 minutes per side. Remove from the pan. Cut in half and serve. If you are making this for kids this grilled version is less messy, but you can definitely fancy up the sandwich by adding some additional Mornay sauce on top, a little more Gruyere cheese, and placing it under the broiler for a couple of minutes until it gets all bubbly. If serving this for a fancier occasion such as brunch after removing the sandwich from the pan, top the sandwich with additional Mornay sauce and some Gruyere cheese and place under the broiler for 3-5 minutes or until the cheese gets bubbly and starts to brown. I ordered a Croque Monsieur Sandwich at a restaurant in Colorado a while ago, and I’m still dreaming about how good it was. A Croque Monsieur is basically the French version of a ham and cheese sandwich. The French twist on the classic is made with high quality ham, Gruyere cheese, and a Mornay sauce -- which is simply a béchamel sauce with added cheese. 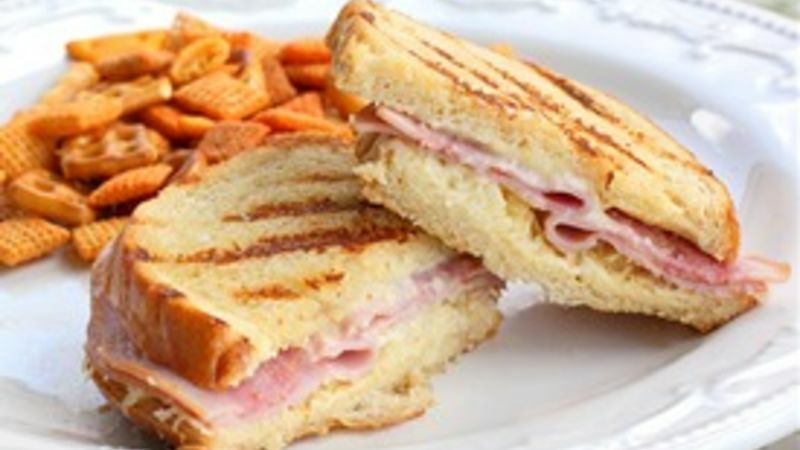 The Mornay sauce is smeared inside and then the sandwich is toasted to create a buttery, cheesy, ham delight. Gruyere cheese was meant to be paired with ham. They complement each other so well. I literally was slapping my kids’ hands away so I could take a picture of this sandwich! 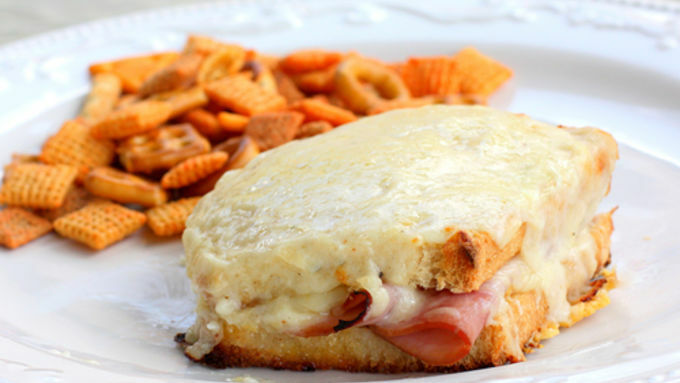 My kids are heading back to school soon, and they would love to have this Croque Monsieur Sandwich in their lunches. Add some Chex™ mix and some fruit for a complete meal that’ll make your kids happy. Now you have a gourmet sandwich for brunch or lunch that has to be eaten with the fork! Supposedly the French consider this fancier version the traditional Croque Monsieur sandwich.